Richard Fleischer might not be considered the most hard-boiled director (the original DOCTOR DOLITTLE, Neil Diamond's THE JAZZ SINGER, RED SONJA... 'nuff said), but he actually helmed his share of gritty features, such as VIOLENT SATURDAY, MR. MAJESTYK and this underrated European crime drama. 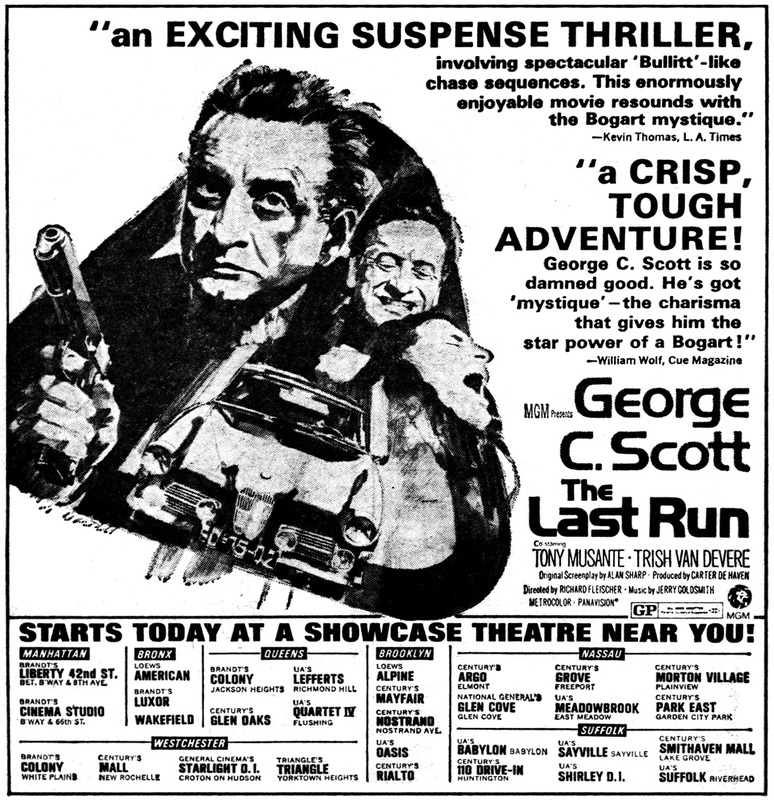 Then-recent Oscar-winner George C. Scott was at the top of his game in his first (and best) pairing with future-wife Trish Van Devere, but this MGM production had its problems -- John Huston was the original director, only to quit over quarrels with Scott, and French temptress Tina Aumont initially had Van Devere's role but wound up another George C. casualty... Harry Garmes (Scott) is a man alone. His wife ditched him long ago, his only child is dead, he's currently living in rural Southern Portugal, and all he has in life is a kickass '56 BMW convertible and his criminal career as a top driver. Garmes hasn't had a gig in nine years but he's accepted one last run, which involves transporting a wiseass young killer named Paul Rickard (Tony Musante), who's escaped from prison and is the polar opposite of laconic, old-school "dinosaur" Harry. Garmes has to drive Paul and girlfriend Claudie (Van Devere, in only her third film) across the border to France, while avoiding any sudden road bumps -- for example, carefully alluding a couple cops. Unfortunately, when Harry finally delivers his 'package' (halfway into the film), everything goes hinky [Note: whenever someone suddenly pulls out a blowtorch, you know there's gonna be trouble], with this trio soon pursued by the police and the mob. In the process, Garmes shows off his skills (as does cinematographer Sven Nykvist, on his first major-studio feature) during a riveting high-speed chase along the winding roads of rural Spain... The screenplay by Alan Sharp (NIGHT MOVES, ULZANA'S RAID) is lean, melancholy, full of attitude, and goes for the least commercial ending possible. At the center of it all is predictably-solid Scott, playing Garmes as the type of guy who looks beaten up by life yet is still prepared to punch back. He knows that if someone knocks on your door, always answer it with a gun; but like most men, he's just enough of a sap to let a dame get the best of him. Musante fills out his amoral role with cocky attitude, but bland Van Devere lacks screen charisma. Still, Scott must've spotted something that the camera missed, because a year later he divorced Colleen Dewhurst (who appears in a small role as Monique, a local prostitute Garmes frequents) and wed Trish. 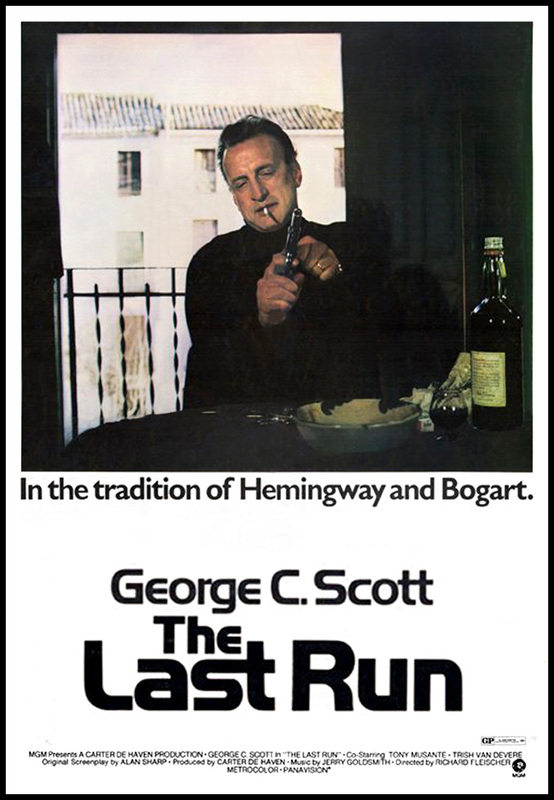 Capped off with a Jerry Goldsmith score, THE LAST RUN was considered a dud when first released, but nowadays stands as a striking existential character study.